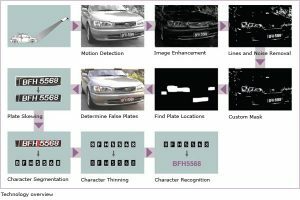 Car License Plate Extraction & Recognition Technology (CARPET) is a License Plate Recognition technology developed by CTI. License Plate Recognition (LPR) is a non-intrusive method of identifying vehicles from their license plates. LPR systems can work with all vehicles including foreign registered vehicles unlike RFID systems that require tags to be installed within cars. CTI also provides a CARPET enabled Car Park Management System (CPMS) which is of great value to companies looking to implement car park management. CARPET helps to reduce traffic violations, track stolen vehicles and make roads safer. CARPET also removes the need for toll booths, increases traffic throughput, stops ticketing fraud, and improves operational efficiency. CARPET captures the images of vehicles entering and leaving car parks thus providing the necessary information for the authorities to take immediate action. High recognition rates for all types of license plates found on South East Asia including multi-line and cursive script, such as Putrajava or Satria. Hardware independent and can be integrated in any existing infrastructure. Supports up to four cameras. Captures and stores different views of vehicle and driver. CARPET has been implemented at all Malaysian Borders crossing points (75 lanes) for monitoring vehicles leaving the country for immigration purposes. CARPET is implemented at the Malaysian Police Headquarters, Bukit Aman for purposes of tracking vehicle entry and exit. In both cases, CARPET was selected from a number of competing systems as it provided the highest rate of accuracy, superior support, and value.